The Grail lore was itself denounced as a heresy by the Vatican. The sixth-century writings of Merlin were expressly banned by the Ecumenical Council, and the original Nazarene Church of Jesus became an "underground stream", aided by such notable sponsors as Leonardo da Vinci and Sandro Botticelli. Even into the Middle Ages-long after the Norman Conquest of England-the Nazarene Church and the long-prevailing cult of Mary Magdalene were prominent in Europe. Women's rights of equality were upheld throughout the Celtic structure-and this was an enormous problem for the male-only priesthood of orthodox Christianity. Like the sapphire Schethiyâ, the Lapis Exilis, crown jewel of the Archangel Lucifer, fell from heaven. Michael, archangel of the sun and the Hidden God of Israel, at the head of the angelic hosts swooped down upon Lucifer and his legions of rebellious spirits. During the conflict, Michael with his flaming sword struck the flashing Lapis Exilis from the coronet of his adversary, and the green stone fell through all the celestial rings into the dark and immeasurable Abyss. Out of Lucifer’s radiant gem was fashioned the Sangreal, or Holy Grail, from which Christ is said to have drunk at the Last Supper. Though some controversy exists as to whether the Grail was a cup or a platter, it is generally depicted in art as a chalice of considerable size and unusual beauty. According to the legend, Joseph of Arimathea brought the Grail Cup to the place of the crucifixion and in it caught the blood pouring from the wounds of the dying Nazarene. Later Joseph, who had become custodian of the sacred relics–the Sangreal and the Spear of Longinus–carried them into a distant country. No adequate interpretation has ever been given to the Grail Mysteries. Some believe the Knights of the Holy Grail to have been a powerful organization of Christian mystics perpetuating the Ancient Wisdom under the rituals and sacraments of the oracular Cup. The quest for the Holy Grail is the eternal search for truth, and Albert G. Mackey sees in it a variation of the Masonic legend of the Lost Word so long sought by the brethren of the Craft. There is also evidence to support the claim that the story of the Grail is an elaboration of an early pagan Nature myth which has been preserved by reason of the subtle manner in which it was engrafted upon the cult of Christianity. From this particular viewpoint, the Holy Grail is undoubtedly a type of the ark or vessel in which the life of the world is preserved and therefore is significant of the body of the Great Mother–Nature. Its green color relates it to Venus and to the mystery of generation; also to the Islamic faith, whose sacred color is green and whose Sabbath is Friday, the day of Venus. The Holy Grail is a symbol both of the lower (or irrational) world and of the bodily nature of man, because both are receptacles for the living essences of the superior worlds. Such is the mystery of the redeeming blood which, descending into the condition of death, overcomes the last enemy by ensouling all substance with its own immortality. To the Christian, whose mystic faith especially emphasizes the love element, the Holy Grail typifies the heart in which continually swirls the living water of eternal life. Moreover, to the Christian, the search for the Holy Grail is the search for the real Self which, when found, is the consummation of the magnum opus. The Holy Cup can be discovered only by those who have raised themselves above the limitations of sensuous existence. In his mystic poem, The Vision of Sir Launfal, James Russell Lowell discloses the true nature of the Holy Grail by showing that it is visible only to a certain state of spiritual consciousness. Only upon returning from the vain pursuit of haughty ambition did the aged and broken knight see in the transformed leper’s cup the glowing chalice of his lifelong dream. Some writers trace a similarity between the Grail legend and the stories of the martyred Sun Gods whose blood, descending from heaven into the earth, was caught in the cup of matter and liberated therefrom by the initiatory rites. The Holy Grail may also be the seed pod so frequently employed in the ancient Mysteries as an emblem of germination and resurrection; and if the cuplike shape of the Grail be derived from the flower, it signifies the regeneration and spiritualization of the generative forces in man. There are many accounts of stone images which, because of the substances entering into their composition and the ceremonials attendant upon their construction, were ensouled by the divinities whom they were created to resemble. To such images were ascribed various human faculties and powers, such as speech, thought, and even motion. While renegade priests doubtless resorted to trickery–an instance of which is related in a curious apocryphal fragment entitled Bel and the Dragon and supposedly deleted from the end of the Book of Daniel–many of the phenomena recorded in connection with sanctified statues and relics can hardly be explained unless the work of supernatural agencies be admitted. History records the existence of stones which, when struck, threw all who heard the sound into a state of ecstasy. There were also echoing images which whispered for hours after the room itself had become silent, and musical stones productive of the sweetest harmonies. In recognition of the sanctity which the Greeks and Latins ascribed to stones, they placed their hands upon certain consecrated pillars when taking an oath. In ancient times stones played a part in determining the fate of accused persons, for it was customary for juries to reach their verdicts by dropping pebbles into a bag. The universe has features which are prime constants, the behavior of materials is one example, which we call the ' laws of physics'. These we can term truths, because they don't vary under a given range of circumstances, even down at the sub atomic level, the weirdness is still a constant, inasmuch as it is constantly weird. Without these prime constants the universe would cease to exist. People aren't naturally ' nice' to each other, they are simply conditioned to fear the consequences of not appearing to be nice to each other. Even so, this barrier is now breaking down and at the grassroots level society is becoming more violent as individuals embrace 'Aquarian Individualism' (aka selfish opportunism) and disregard their conditioning. In ' Genesis of the Grail Kings' Gardner commented on the love that the Anunnaki had for social order, which was echoed in Transylvania where vampires were said to have a reputation for pathological meticulousness and where nearby, Dracula ran his kingdom with the precision of a well oiled machine. The ancient forests of giantOak and Beech are no more and the sacred places have been either built on in acts of blasphemy by greedy religion or torn up by the mindless merchant-class ancestors of today's mindless, middle-class consumer population. First signs of settlement in this region have been dated to about 3500 BC, but the hill site of Carsac – a Celtic that has been retained at other sites in the south – became an important trading place in the 6th century BC. The Volcae Tectosages fortified the oppidum. Carcassonne became strategically identified when Romans fortified the hilltop around 100 BC and eventually made it the colonia of Julia Carsaco, later Carcasum (the process of swapping consonant is a metathesis). The main part of the lower courses of the northern ramparts dates from Gallo-Roman times. In 462 the Romans officially ceded Septimania to the Visigothic king Theodoric II who had held Carcassonne since 453; he built more fortifications at Carcassonne, which was a frontier post on the northern marches: traces of them still stand. Theodoric is thought to have begun the predecessor of the basilica that is now dedicated to Saint Nazaire. In 508 the Visigoths successfully foiled attacks by the Frankish king Clovis. Saracens from Barcelona took Carcassonne in 725, but King Pepin the Short (Pépin le Bref) drove them away in 759-60; though he took most of the south of France, he was unable to penetrate the impregnable fortress of Carcassonne. Main article: County of Carcassonne A medieval fiefdom, the county of Carcassonne, controlled the city and its environs. It was often united with the County of Razès. The origins of Carcassonne as a county probably lie in local representatives of the Visigoths, but the first count known by name is Bello of the time of Charlemagne. Bello founded a dynasty, the Bellonids, which would rule many honores in Septimania and Catalonia for three centuries. In 1067 Carcassonne became the property of Raimond Bernard Trencavel, viscount of Albi and Nîmes, through his marriage with Ermengard, sister of the last count of Carcassonne. In the following centuries the Trencavel family allied in succession either with the counts of Barcelona or of Toulouse. They built the Château Comtal and the Basilica of Saint-Nazaire. In 1096 Pope Urban II blessed the foundation stones of the new cathedral, a Catholic bastion against the Cathars. Carcassonne became famous in its role in the Albigensian Crusades, when the city was a stronghold of Occitan Cathars. In August 1209 the crusading army of Simon de Montfort forced its citizens to surrender. After capturing Raymond-Roger de Trencavel, imprisoning him and allowing him to die, Montfort made himself the new viscount. He added to the fortifications. Carcassonne became a border citadel between France and the kingdom of Aragon (Spain). In 1240 Trencavel's son tried to reconquer his old domain but in vain. The city submitted to the rule of the kingdom of France in 1247, and King Louis IX founded the new part of the town across the river. He and his successor Philip III built the outer ramparts. Contemporary opinion still considered the fortress impregnable. During the Hundred Years' War, Edward the Black Prince failed to take the city in 1355, although his troops destroyed the Lower Town. The Cross of Lorraine, a symbol linked to the Templars, the Angevins, and French nationalism, also had its genesis as a Sumerian ideogram. It was a symbol denoting kingship, and stood for "Kad", a title given to the kings of Phoenicia and Akkadia. Another title for kings was "Shepherd", and the ideogram for this designation was very similar: it was a Cross of Lorraine with an extended lower portion, curved so as to suggest a shepherd's staff. When various members of the House of Anjou plotted to topple the Valois dynasty of France, the symbol of the conspirators was the Cross of Lorraine, the heraldic emblem of Rene d'Anjou, said by Charles Peguy to represent the "arms of Christ", "the arms of Satan", and, strangely, the blood of both. Ren� was the Angevin monarch who, at the time of the renaissance, single-handedly spearheaded a Hermetic revival in Europe. It was he who personally convinced Cosimo de Medici to translate many ancient texts such as the Corpus Hermeticum into various European tongues for the first time ever. 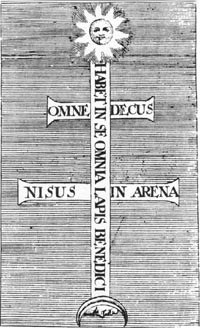 And when Corpus Hermeticum was first published in France, the dedication it bore was to Marie de Guise, wife of James Stuart V, mother of Mary Queen of Scots, and a descendant of Ren who also adopted the Cross of Lorraine as a personal symbol. That the Cross of Lorraine is a symbol embodying the Hermetic ideal is fairly obvious. The Angevins were primarily advocates of the Regia, or Royal Art, of hermeticism; a tradition which according to legend was passed down to man by a race of fallen angels. This isn't at all inconsistent with the perennially Luciferian overtones associated with the entire Angevin saga. Interestingly, the Cross of Lorraine bears an uncanny resemblance to the sigil of Baphomet employed by British Magus Aleister Crowley, and the meaning of the two symbols would appear to be virtually synonymous. Baphomet is, after all, the penultimate hermetic symbol, whether depicted by Crowley in the form of a cross, or by Eliphas Levi as a goat-headed hermaphrodite. And the sigil used by Crowley was also employed by ancient alchemists as a device whose meaning was literally "very poisonous." In fact, the symbol was commonly affixed to containers of toxic substances in Europe as recently as the mid-twentieth century. To the alchemists, of course, the symbol and its very meaning had far more esoteric connotations. To them, poison represented an agent of transformation, a vehicle for the reconciliation of opposites. And there is an alchemical myth about a poison which for most men is extremely deadly, while for the elect it confers mastership and absolute power. Echoes of this idea recur as a motif in various aspects of the Grail lore. It would seem that the alchemists accorded this symbol very much the same meaning attributed it by Crowley, which in turn echoes what the Cross of Lorraine embodied for Rene d'Anjou. It is little known, but the Cross of Lorraine was also the official emblem of the Knights Templar. Though they are more frequently associated with the symbol of the red equilateral cross, their true symbol first and foremost was the Cross of Lorraine, and many Templars awaiting death at the stake pursuant to the Friday the 13th persecutions drew the emblem on the walls of their cells. There is still a degree in certain rites of Freemasonry called the Knights Templar, whose symbol is the Cross of Lorraine. It is interesting to note that even the less esoteric-looking equilateral cross used by the Templars had essentially the same meaning: that of the union of opposites, the intersection of creative force and destructive force, or the union of male and female principles. It was a fundamental occult symbol, and it was in deference to the idea which it embodied that medieval occult rituals were often held at crossroads. The Cross of Lorraine is far more explicit in it's iconography: the bar above mirroring the bar below, both of which are symmetrically affixed to a central pillar that provides balance and equilibrium. As above, so below is, after all, a Hermetic maxim. And the three bars of which the cross is composed echo Eliphas Levi's concept of the true trinity. Levi posited that the world is governed by two primordial forces, one creative, the other destructive. The equilibrium between these two forces constitutes a third force, and the union of the three constitutes what some might refer to as... God. The central role of the principle of equilibrium in various occult arts cannot be overstressed. For Master Mason Albert Pike, equilibrium represented the Royal Secret, the pivotal principle upon which the universe is ordered. And Pike's specific designation of equilibrium as a royal secret is of particular significance because, as previously mentioned, Hermeticism has traditionally been known as the Royal Art, and its central tenet is essentially that of equilibrium. And too, when Pike calls it a Royal secret, he isn't speaking figuratively, but strictly in literal terms. Hermes, according to legend, was the sole receptacle of the secret doctrine of the antediluvian world, which he revived after the flood and passed down to the Kings. As you'll recall, this secret knowledge was thought to have been taught to man by a race of Gods or fallen angels. This knowledge was kept secret because it was probably recognized that for all but an elect few, such thought would no doubt bring about their ruin. This brings to mind the concept of the alchemical poison. Kings and aristocrats would understand how to wield and apply the secret doctrine because it was believed that they were in fact flesh and blood descendants of the Forgotten Race which had come down to take the wives of men. The Fingerprint of God or the Mark of Cain? The most prominent symbol associated with the Grail bloodline, aside from the pentagram and the rose-cross, is the Cross of Lorraine. As has been said elsewhere, this cross was the heraldic device of both the Angevins and the Knights Templar. The symbol can be dated back to the early deified kings of Sumeria, where it had the title of "Kad", a term denoting both king and lord. Over the years, this symbol has been presented in many variations, perhaps the most well-known being the one used by the French Free Forces in WWII, patterned after a configuration favored in medieval alchemical/Hermetic texts (See illustration.) This particular representation of the cross seems to embody specific geometric relationships between the component parts of the configuration - and indeed it does. It, like the pentagram, is a symbolic representation of the golden division principle, with its dimensions defined by the famous Fibonacci spiral. The Cross of Lorraine, then, like the spiral that characterizes it, is another configuration of "the fingerprint of God." Not only can the Fibonacci spiral be super-imposed over it, the bars from which it is composed bear a golden division relationship to one another; the top horizontal bar is to the bottom as the bottom bar is to the vertical bar. And too, the elements which comprise the cross define two irregular pentagrams, both of which are central to the mystery of Rennes-le-Chateau. As if to emphasize the hermetic nature of the Cross of Lorraine, an image of the sun (the eternal male principle) crowns it, and an image of the moon (the eternal female principle) is to be seen beneath it. In alchemy, the cross represents a crucible, a place in which opposites are dissolved and combined, and matter transformed. We see a christianized equivalent of this idea in the crucifix, emblematic of Christ’s suffering on the cross, and his subsequent death, resurrection, and transformation(1). Upon the middle pillar of the cross is inscribed (in Latin): "The blessed stone contains everything within itself." The "blessed stone", then, would appear to be the legendary Philosopher’s Stone, a melding of the eternal male and female essence, as forged within the crucible of the Cross of Lorraine. Could this same blessed stone bear some relation to, or in fact be synonymous with, the Rock of Sion? Further examinations of this medieval etching indicated that a code of some sort might be hidden within the Latin inscriptions that cover the cross. For instance, on the endpoints of the cross were six letters, three of them vowels, a seemingly perfect selection for generating any number of words. Yet the odds of discovering words bearing any relationship to the Grail mystery would be astronomical, unless someone purposely put them there! Almost immediately upon examination of this picture, we began to discover a series of words encoded in the cross. The first, HOSANI, would appear to be a Latinized version of the more common Hebrew word, Hosanna. The second, IANOSH, was obviously a Latinized version of Enoch, a figure whose name recurs incessantly in regards to our research. We had encountered many variations in the name Enoch (Enosh, Enos, etc. ), so to find yet another wasn’t at all unusual, especially given the fact that it was discovered within the context of a Latin text. This alternate spelling was also interesting in that it was highly suggestive of the connection between Enoch and Oannes, two figures who were often said to equate with one another. Both were said to have taught writing, etc. to mankind. One is intimately associated with water, the other with the Flood. The first two words, Hosani and Ianosh, were found by connecting the letters at the six points at the ends of the crossed bars by means of an irregular (albeit symmetrical) zig-zagging line. The first line starts at the top and ends at the bottom. The second line mirrors the first and originates instead at the bottom. A third word can be found by connecting just the five letters on the cross’ lower section. The line that co-joins them forms a kind of irregular (yet again very symmetrical) "M" shape. And the five points thus defined are pentagonal in nature. The word thus created is ASION. Obviously, the name Sion is of central importance to all those who adopted the Cross of Lorraine as their sacred symbol. Yet we had never encountered the term Asion. There are a number of names that turn up in various mythologies that seem to bear some sort of relation to Sion. In esoteric Judaism, there is a fallen angel named Sihon. There are figures connected to the Flood named Saon, and Iasion. Scion, a word still in common usage, has a pronunciation identical to Sion, and its most well-known definition is "descendant , son or heir." And it’s most often used in regards to powerful or well-known families (those perceived as dynasties.) A less well-known meaning of scion pertains to the grafting of vines, particularly in relation to grape vines and the production of wine - a recurring symbolic theme for the Grail bloodline, as it alludes to the intermarriage of sacred and royal pedigrees. The word Asion, however, is very likely what is known as a patronym. The patronym is simply a name indicating an individual’s descent, or patrimony. They were very common in ancient times, and in numerous cultures. For instance, "Ailu" means simply, "son of Ilu"; "Amuru", means "son of Muru", and so on. Patronyms were most often used by kings and the aristocracy. Assuming Asion to be such a word, the three words encoded in the cross would produce the sentence: "Praise be to Enoch, son of Sion." Of course, we know that Enoch was the son of Cain. Could it be that Cain is the true esoteric meaning of "Sion"? If so, it would make sense. After all, Cain would have been the figure from which the Grail bloodline descended. (See this author’s article, Lucifer’s Children: The Descendants of Cain in Dagobert‘s Revenge Vol. 4#1.) The pronunciation of many ancient words varied widely from time to time and place to place. The goddess Kybele, for instance, was later known as Cybele. The "C" in Cain can be pronounced with a hard "K" sound , or a soft "S" sound. And in fact, the word that served as the basis of "scion" was originally spelled cian, but was pronounced with the "S" sound. In another culture it was spelled cihan and also pronounced the same. Sion could very well be an esoteric title for Cain, and the phrase we’ve decoded - "Praise be to Enoch, son of Cain" - seems to have a sense of internal logic to it. Cain would necessarily have been an important figure to his descendants, who, due to his less-than-auspicious depiction in the Old Testament, may have been preserved in their tradition, camouflaged beneath a code name. Sion constitutes the axis about which the Grail mystery revolves, yet remains the tradition’s most sub rosa aspect. If Cain is Sion, the oft referred-to "Rock of Sion" could merely represent the seed of Cain; the stone which had fallen from Heaven, and the rock upon which the bloodline had been founded. How often have we heard the enigmatic assertion that the rock which the builder of the Temple rejected "shall be the cornerstone"? Certainly, the figure most rejected by God (Lucifer excepted) in the Old Testament was Cain. And certainly Cain was the cornerstone of a dynasty of deified kings, his name even serving as the very root word from which our modern word "king" derives. In an alternate reading of the tale of "the stone which the builder rejected", it is said that it shall serve as the capstone. Given the very real traditions of Cain’s purported Luciferian heritage from fallen angels, this would put a whole new spin on the well-known symbol of the illuminated eye atop the pyramid. Lastly, there is yet another bizarre pattern to emerge from the sentence "Praise be to Ianosh, son of Sion." The Oannes connection to Ianosh/Enoch is of interest in that Oannes is the basis of Johannes, from whence we derive the name John (yet another name that recurs incessantly in regard to the Grail mythos, the life of Christ, and particularly, the Priory of Sion. ) And strangely, we have come across more than a few instances in which the name John has shown up as an anglicized equivalent of the word Sion(2). It seems clear that the Grail family understood the significance of their descent from the figures known to history as Cain, Enoch and Oannes. It seems equally clear that they enshrined these figures in names at once both innocent-seeming and mysterious. Like so many other aspects of the Grail mystery, they contrived to secret them from public view by hiding them in plain sight. This particular depiction of the Cross of Lorraine, it seems, serves a multi-faceted function. It is at one and the same time an iconic depiction of both the fingerprint of God and the Mark of Cain; a repository of sacred knowledge, and a secret genealogy. Addendum: The foregoing theory represents one possible interpretation of what we’ve found. As with most things Grail-related, there are often many possible interpretations, and more often still, multiple layers of meaning existing simultaneously. For instance, both the names Ianosh and Asion seem to be compounded from two words, each of which appear to be derived etymologically from the same sources. The "ian" and "ion" portions of the name contain "An" and "On", both Mesopotamian names of God. The "as" and "osh" portions of the name relate to Ash, a word meaning "Lord." Therefore, Ianosh and Asion may be titles in addition to being proper names, both meaning either "the Lord God", or "God the Lord."